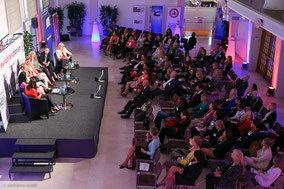 Women Leadership Forum 2014 - womenleaderships Webseite! The WOMEN LEADERSHIP FORUM facilitates the networking of successful women and gives an opportunity to learn from the best. Women on the rise: Nowadays women are as well educated as men. They have equal leadership abilities. They recognize what is important in business and understand what an enterprise nowadays needs. However, they rarely occupy top positions. In the sectors where women are underrepresented, the potential, knowledge, point of view and the problem-solving approach of more than 50 per cent of the population dwindles away. Different surveys prove that involvement of female Know-How in the economy would increase growth by approximately 30 per cent. How can we support women to approach terrains, which are dominated by men? The answer is by learning from the best. All of us: women, men, companies. 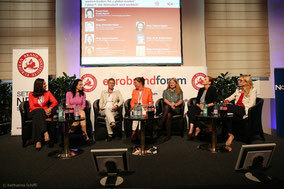 What could help is: femalefriendly jobs, establishing networks: for child care and careerboosting activities. Company executives talk about to what extend your company contributes to the mentioned above. The reason for that is the fact, that the one who gives wins. The working environment is in change. The one who wants to be competitive, enables women by diverse measures to show their potential. Such activities include support in terms of private and respectively family life, internal women supporting programs and awareness raising in the companies. Surveys conducted by Deloitte and Boston Consulting Group show that a mix of women and men already at the rate of 1:2 in the company improve its corporate culture, stock performance and economic performance. Mixed teams are more productive.